Primates in captivity can live well beyond their natural life expectancy. This is due in part to good preventative veterinary care. Meeting our primates’ health maintenance needs can help extend their lives and keep them healthy and active long into their senior years. Primates routinely must be immobilized for veterinary examinations and procedures. Fear of having our primates anesthetized often discourages us from seeking preventative veterinary care for them. Healthy monkeys tolerate anesthesia very well and rarely have complications. When a primate has side effects or dies under anesthesia it typically is when the animal is sick and is being sedated to diagnose or treat an illness. Because primates instinctively hide symptoms of illness, by the time we seek treatment for them they may be very ill and at greater risk of complications from anesthesia. 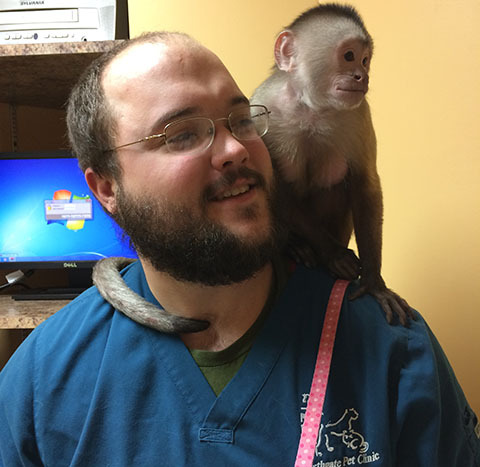 Elective well-monkey visits with your vet can identify potential health risks, prevent disease and keep your monkey healthy and safe. William Kirk Suedmeyer, DVM, Dipl. ACZM is Director of Animal Health and Research at the Kansas City Zoo. Dr. Suedmeyer spoke on the topic of preventative health care for primates in captivity at the USDA Primate Symposium 2017. Primates at the Kansas City Zoo undergo a routine physical exam every two years. The following elements are included in their health maintenance examination. A routine physical exam for our companion primates may include some or all the same elements.